When you stay at 3rd Street Flats, Historic Downtown McMinnville is at your doorstep. You don’t need a car as much as you need a good pair of shoes–actually, our locations are so good even a pair of fabulous-but-not-so-comfy shoes will do. 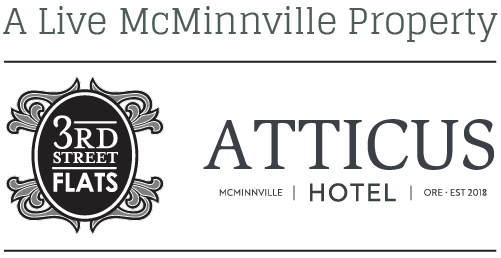 Everything you’ll want to see and do in Downtown McMinnville is within walking distance. But if you’d like to experience the rest of the valley, wheels are a must. You can rent your own at the Portland Airport and blaze your own trail with map in hand, rent a car or limo for the day, or trust an experienced guide to show you the best of the valley. Here are some resources to help you plan your Yamhill Valley experience. . .
We highly recommend Insider’s Wine Tour. Owner John Swenson specializes in tours of private boutique wineries. He has years of experience and lots of fabulous insights to share about the region. Wheels N Time offers personalized transportation service at an hourly rate. Owner Carolyn Smithrud will plan a wine tasting outing for you or follow your lead and take you on your own itinerary. Debra Kabarsky of A Vineyard Wine Tour offers private tours in a Mercedes van for groups of up to ten people. A fabulous lunch from Valley Commissary is included with each tour, as is a pairing at the final stop of the day. Fred and Marie from A Nose for Wine provide private customized tours for groups both large and small. Oregon Posh, is focused on creating connections and immersive experiences for visitors to Oregon’s wine region. Oregon Posh prides itself on the perfect pairing of luxury and authenticity. If you’d like to tour a smaller number of wineries without the gasoline, check out Equestrian Wine Tours. They offer the chance to experience the valley on horseback. For large groups The Trolley offers a unique way to experience the tastes and vistas of the Valley. Twilight Limousine offers both cars and tours of the valley. Sky King Limo offers limousine services for small groups of six or less. Main Street Drivers – Designated Drivers & Wine Tours provides local and insured designated drivers for clients who prefer to use their personal or rental vehicle for wine touring rather than hiring a car or limousine. All drivers are local residents who have an insider’s knowledge of the many wineries that make up the Willamette Valley.